Drink Smart: The 13th century was a time of over-the-top indulgence in eating and drinking. Hours-long banquets, free-flow wine and (sometimes questionable) experimentation were de rigueur. Then along came King Alfonso X of Castile. While recuperating from an illness old Fonzi could only eat bite-sized portions of food, and decreed that alcohol must be served with food. And so, the tapas culture of small bites and big drinks was born. It is this legacy that The Wise King plays on. 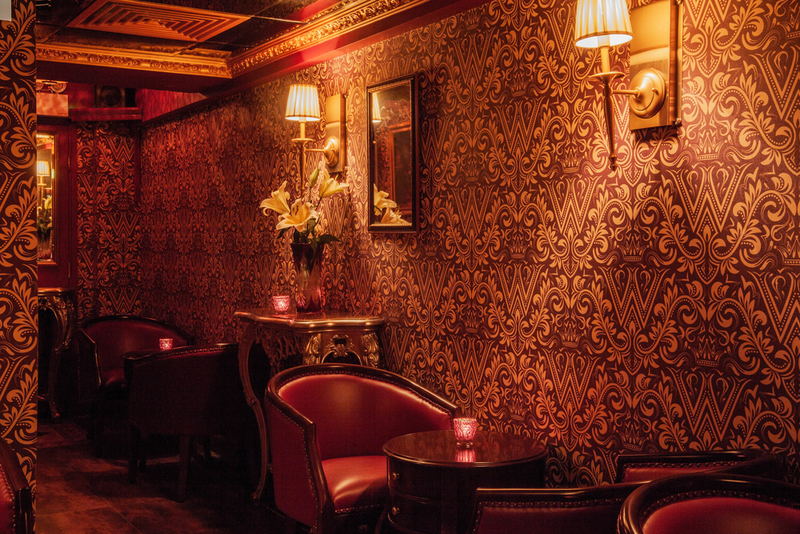 This tiny bar is a recent addition to Soho, but what it lacks in size it makes up for with quality cocktails and bar bites. Look & Feel: The Wise King is all about surprising you. Outside, a mural – of, yes, three wise kings – points the way to the bar’s basic door. Inside though, the bar is a nod to the splendorous overindulgence of the 13th century. Damask-style papering with a hidden-but-noticable W pattern adorns the wall. Seats are plush and covered in lush red velvet. In a corner, a old-school wooden bookshelf with glass doors is stocked with a veritable library of books, all pertaining to King Alfonso X and his intellectual legacy. Over the speakers, light, easy jazz tunes lull you into a state of zen. It’s only when you pay attention that your realize they’re smooth renderings of modern-day pop tunes. Interiors at The Wise King. On the Menu: There’s not too much to the menu, but what it does, it does well. Cocktails are the main event at The Wise King. El Sabio (Spanish for The Wise, naturally) is a quaffable concoction of spiced peach and pineapple reduction with cava, while the Pacharán Manhattan packs a punch with Woodford Rye Whiskey, Blackthorn Liqueur and Abbott’s Bitters. Stick to Alfonso’s rules and pair your drinks with charcuterie plates or small plates like the Scarpetta (minced beef and pork with cherry tomatoes and Picoroni cheese served on toast) and the croquettes of Machengo cheese and Serrano ham. For a nightcap, try the oh-so-sweet Turrón Sour, a blend of Woodford Bourbon, toasted nuts honey syrup, citrus, PX foam, all served with a block of nougat. 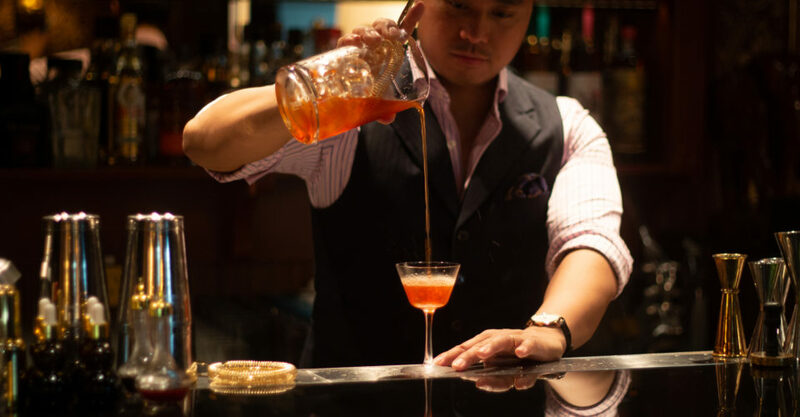 Jeng: The cocktails are genuinely good, craft concoctions, and you can tell a lot of thought and preparation has gone into every detail. Not so jeng: This is a tiny little space, so get there early if you want to nab a good seat. Great for: Intimate dates, quiet catch ups. FYI: To get here, turn onto Graham Street from Staunton Street, then take the first right (onto Tsung Wing Lane) and look for the mural of the three wise kings.